The Save Darfur Yarmulke (yarmulka, kippah, kippot) is an original fundraiser started by Robert Goodis in 2004. Since its inception, the idea has raised over $6000 for Darfur-related charitable efforts and even inspired Obamakas. 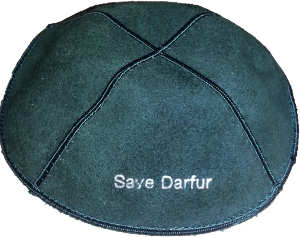 The standard Save Darfur yarmulke is forest green suede with silver ink. Text on the outside of the kippot says Save Darfur, while text on the inside says Robert Goodis Foundation (prior versions were inscribed Mason-Dixon Darfur Alliance or Robert Goodis Charities). These are professionally manufactured by a specialty Judaica shop in Brooklyn, NY, and reflect the highest quality brought to you by the world’s largest and leading source for personalized kippot. On top of the standard yarmulkes, we offer Save Darfur kippot in a wide array of colors, and we have worked with customers on special orders with custom inscriptions for bar and bat mitzvahs, weddings, and other occasions. We have even prepared custom inscriptions in place of the Save Darfur text to support other charitable causes. Prices are flexible. 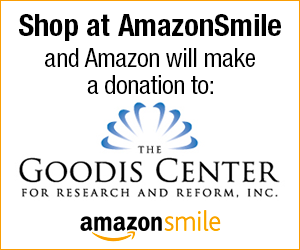 One-hundred percent of proceeds benefit charitable efforts. The suggested donation for a single kippah is $10.00, but some orders can process for as low as $2.75 each. Rush orders are available, but may affect pricing. Please contact us for more information on bulk orders and customization. Custom quotes may take extra time to handle, as we have to coordinate with our manufacturer.